Danish director Carl Theodor Dreyer once said: “Nothing in the world can compare to the human face. It is a land one can never tire of exploring.” No director explored a face more remarkable than actress Renee Falconetti's, and never to such memorable effect as in “The Passion of Joan of Arc” (1928). Falconetti was hardly an obvious choice for the title role. Not only was the 35-year-old actress nearly twice as old as teenage Joan, she had only played small roles in two films a decade earlier, and was best known in Paris as the affable star of comedic stage plays. She likely had little ideal of the ordeal facing her, no doubt one of many reasons Dreyer cast her. Both Falconetti and Dreyer faced considerable pressure. Nearly a half-millennium after burning Joan at the stake (ostensibly for the crime of wearing men's clothing), the Church made up for their little boo-boo by officially canonizing her in 1920. Joan was already one of France's most beloved icons, but Saint Joan now became a world-wide sensation. The bonanza of Joan-related projects included the publication of a new book by Pierre Champion, which included the miraculously-preserved transcript of her trial. Dreyer was actually commissioned by a French studio to adapt a different book on Joan, but he focused primarily on the transcript, which provides most of the film's text. Dreyer's hiring generated protests before production ever began – he was neither French nor Catholic, so how could he tell the story of our beloved Joan? Casting a French actress may have ameliorated the outrage a bit, but sticking closely to the historical record also guaranteed pushback from the Church, not keen on reminding the public of that time they tortured and murdered of a teenage girl. The one in 1431, I mean. The one in 1431 in Rouen. Dreyer still took his share of liberties with history, mostly by compressing a months-long trial into a single day. This compression amplifies the intensity from the start, and Dreyer's other stylistic decisions only further up the ante. Though the film unfolds in one location over one day, the rapid cutting (approx. 1500 shots in an hour-and-a-half film) and the relative lack of establishing shots generate a queasy, disorienting feeling expressive of the overwhelming stress Joan is placed under by the leering, bullying, mocking Church inquisitors. Consecutive shots rarely follow the same character, and tight close-ups disrupt a clear sense of screen geography. Ultimately, the viewer can focus only on one steady element at the core of this cinematic world, Joan's face. In one invasive close-up after another, Falconetti sweats and strains, glares defiantly or blinks back tears, and looks heavenward to the one true vision she can always see, and viewers struggle through jarring experience along with her. For ninety years now, filmgoers have been exploring that face, the face that defines cinema as much as any single image in the history of the medium. Falconetti walked away from the cinema after her grueling ordeal on Dreyer's set, and no other actor has ever exceeded her performance. The film is presented in its original 1.33:1 aspect ratio. From the Criterion booklet: “This new digital restoration by Gaumont and the Centre national du cinema et de l'image animee was created in 2K resolution from a duplicate negative made from an original positive print held by the Danish Film Institute.” That might sound a bit complicated, but understand that we're lucky a complete version of “Passion” exists at all and, indeed, most audiences didn't have access to one until the 1980s. For more information on the film's labyrinthine journey through the decades, you can read my brief essay at this link. This is the first time I've gotten to see “Passion” in a high-def version and if it's not flawless, it's certainly a major improvement over anything I've seen before. The level of detail visible in the many closeups of Falconetti's face only heighten the intense experience of watching this film. Criterion has also given viewers the option to watch the film at 24 frames per second or at 20 frames per second. As you may know, 24 frames per second is the standard projection speed for films in the sound era (synch sound needs to be played at that speed), but rates varied significantly during the silent era. There is no definitive “correct” fps speed to watch the film at, though scholar Casper Tybjerg argues convincingly that the slower 20 fps version also makes the actors look more natural in motion. The 24 fps version plays at 81 minutes, the 20 fps at 97 minutes. Not only is there no evidence that Dreyer ever selected an official score to be played with the film, it is possible he actually preferred to be played silently altogether, which would have been unusual for the silent era. In any case, Criterion offers a few audio options. For the 24 fps version, viewers can play the film silently (OK, your Mute button would achieve the same thing) or with two scores: Richard Einhorn's “Voices of Light” score which many modern viewers are familiar with, and also a recent (2010) score by Portishead's Adrian Utley and Goldfrapp's Will Gregory. You can also select an Audio Commentary by Casper Tybjerg, recorded in 1999. For the 20 fps version, viewers can choose the silent version or a 2005 score by Mie Yanashita. 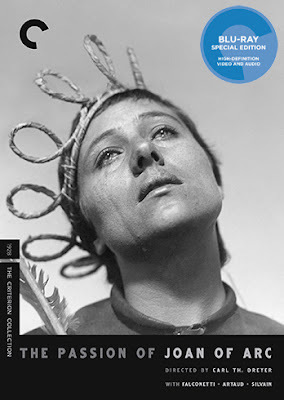 Criterion originally released “The Passion of Joan of Arc” on DVD way back in a whole different century (1999). This Blu-ray upgrade imports many of the old features from the DVD and adds a few new ones. We'll start with the new stuff first. Now that Criterion has included both 24 fps and 20 fps versions of the film, scholar Casper Tybjerg provides a discussion (12 min.) of the merits of each version. The thick insert booklet includes a new essay by scholar Mark Le Fanu, and also a brief statement by Dreyer and the libretto of the “Voices of Light” score. 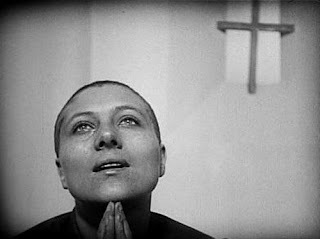 “The Passion of Joan of Arc” is the crowning achievement of one of the greatest directorial careers in cinema, and Falconetti delivers a performance for the ages. Criterion's new Blu-ray release provides “Passion” the high-def treatment it deserves, and the new transfer along with the multiple scores (and fps rates!) and other extras make this an early favorite for Blu-ray release of the year.